About a year ago I wrote a blog post about a mysterious “line” in the X-ray spectra of galaxy clusters corresponding to an energy of around 3.5 keV. The primary reference for the claim is a paper by Bulbul et al which is, of course, freely available on the arXiv. The claimed feature – it stretches the imagination considerably to call it a “line” – is shown in red. No, I’m not particularly impressed either, but this is what passes for high-quality data in X-ray astronomy! Anyway, there has just appeared on the arXiv a paper by the Hitomi Collaboration describing what are basically the only set of science results that the Hitomi satellite managed to obtain before it fell to bits earlier this year. These were observations of the Perseus Cluster. High-resolution X-ray spectroscopy with Hitomi was expected to resolve the origin of the faint unidentified E=3.5 keV emission line reported in several low-resolution studies of various massive systems, such as galaxies and clusters, including the Perseus cluster. 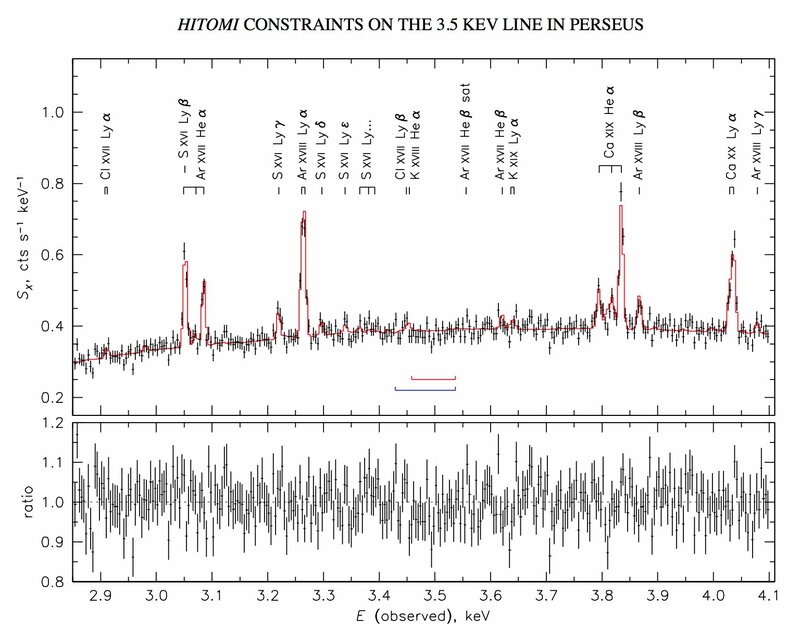 We have analyzed the Hitomi first-light observation of the Perseus cluster. The emission line expected for Perseus based on the XMM-Newton signal from the large cluster sample under the dark matter decay scenario is too faint to be detectable in the Hitomi data. However, the previously reported 3.5 keV flux from Perseus was anomalously high compared to the sample-based prediction. We find no unidentified line at the reported flux level. The high flux derived with XMM MOS for the Perseus region covered by Hitomi is excluded at >3-sigma within the energy confidence interval of the most constraining previous study. If XMM measurement uncertainties for this region are included, the inconsistency with Hitomi is at a 99% significance for a broad dark-matter line and at 99.7% for a narrow line from the gas. We do find a hint of a broad excess near the energies of high-n transitions of Sxvi (E=3.44 keV rest-frame) – a possible signature of charge exchange in the molecular nebula and one of the proposed explanations for the 3.5 keV line. 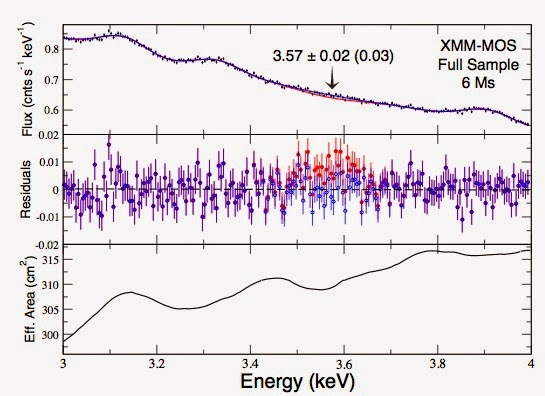 While its energy is consistent with XMM pn detections, it is unlikely to explain the MOS signal. A confirmation of this interesting feature has to wait for a more sensitive observation with a future calorimeter experiment. The spectrum looks amazingly detailed, which makes the demise of Hitomi all the more tragic, but the 3.5 keV is conspicuous by its absence. So there you are, yet another supposedly significant feature that excited a huge amount of interest turns out to be nothing of the sort. To be fair, as the abstract states, the anomalous line was only seen by stacking spectra of different clusters and might still be there but too faint to be seen in an individual cluster spectrum. Nevertheless I’d say the probability of there being any feature at 3.5 keV has decreased significantly after this observation. P.S. rumours suggest that the 750 GeV diphoton “excess” found at the Large Hadron Collider may be about to meet a similar fate. Earlier this week I went to a seminar. That’s a rare enough event these days given all the other things I have to do. The talk concerned was by Katie Mack, who was visiting the Astronomy Centre and it contained a nice review of the general situation regarding the constraints on astrophysical dark matter from direct and indirect detection experiments. I’m not an expert on experiments – I’m banned from most laboratories on safety grounds – so it was nice to get a review from someone who knows what they’re talking about. One of the pieces of evidence discussed in the talk was something I’ve never really looked at in detail myself, namely the claimed evidence of an emission “line” in the spectrum of X-rays emitted by the hot gas in galaxy clusters. I put the word “line” in inverted commas for reasons which will soon become obvious. The primary reference for the claim is a paper by Bulbul et al which is, of course, freely available on the arXiv. is very significant, at 4-5 astrophysical sigma. I’m not sure how to convert astrophysical sigma into actual sigma, but then I don’t really like sigma anyway. A proper Bayesian model comparison is really needed here. If it is a real feature then a plausible explanation is that it is produced by the decay of some sort of dark matter particle in a manner that involves the radiation of an energetic photon. An example is the decay of a massive sterile neutrino – a hypothetical particle that does not participate in weak interactions – into a lighter standard model neutrino and a photon, as discussed here. In this scenario the parent particle would have a mass of about 7keV so that the resulting photon has an energy of half that. Such a particle would constitute warm dark matter. On the other hand, that all depends on you being convinced that there is anything there at all other than a combination of noise and systematics. I urge you to read the paper and decide. Then perhaps you can try to persuade me, because I’m not at all sure. The X-ray spectrum of hot gas does have a number of known emission features in it that needed to be subtracted before any anomalous emission can be isolated. 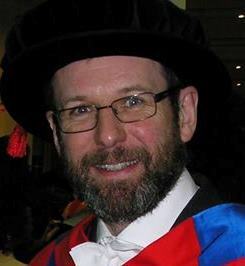 I will remark however that there is a known recombination line of Argon that lies at 3.6 keV, and you have to be convinced that this has been subtracted correctly if the red bump is to be interpreted as something extra. Also note that all the spectra that show this feature are obtained using the same instrument – on the XMM/Newton spacecraft which makes it harder to eliminate the possibility that it is an instrumental artefact.